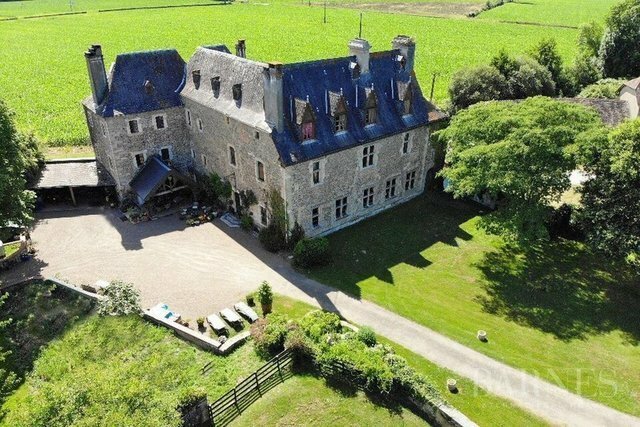 Rare historic property dating originally from the 12 century for sale in the Béarn with approximately 700 m² of living space with farm buildings of about 1.500 m², an orangery,a guest house, a caretaker's lodge and an appartment 120 m². 5 reception rooms, 10 bedrooms and many noble features including vaulted ceilings,mullion Windows, wood panelling, parquet floors, marble fireplaces and stone floors. Many commercial possibilities for this very large property and its 7 acres of private formal gardens. Shops 5 minutes drive. TGV and motorway exit 10 minutes and international airport of Biarritz 45 minutes drive.